Sky bridges between buildings are mainly incorporated into the architecture for pedestrian safety and convenience, said Zeon Properties Group chief executive officer Leon Lee. “They make it easy for occupants to walk between buildings without having to go all the way to the ground floor,” he said. These connectors, he said, have the added advantage of separating pedestrians from pollution and noise. He said in developed cities around the world, there could be several kilometres of sky bridges connecting many buildings high above the streets. 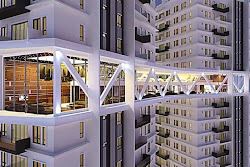 In Bukit Mertajam, Penang, occupants of the Prominence condominium will luxuriate in their exclusive sky bridge, which connects two towers of the condominium project at levels 27 and 28. “This double-level sky bridge will make it convenient for occupants to drop by their neighbours’ homes on the other building,” Lee explained. Besides fulfilling the principal purpose of convenience, the Prominence sky bridge will boast an array of exclusive facilities for residents. “The condo’s indoor and outdoor gym will be on the sky bridge. Residents can release their stress by working out while enjoying the view at about 100m above the streets,” he said. A dining pad, lounge, karaoke, yoga deck and reading patio will make up the other facilities occupants can enjoy on the sky bridge. “Residents can book the dining pad, lounge and karaoke to host exclusive parties. There will be complete furnishings and also the full range of karaoke sound systems,” Lee added. Other facilities in Prominence include an infinity swimming pool, kids’ pool, aquatic gym, Jacuzzi, boardwalk, garden cabanas, putting green, indoor badminton and outdoor three-person basketball courts, multi-function area, children’s playground and BBQ patio. Prominence is the latest upmarket condominium project in Bukit Mertajam. Bionic Development Sdn Bhd, a subsidiary of Metech Group Berhad, is developing Prominence while Zeon Properties is the exclusive agent. The Metech Group started as a humble metal foundry business in Penang in 1955 and has since diversified into property development. Previous projects by Bionic Development include Taiwan’s Bionic Palace and Bionic City. At an average price of about RM350 per sq ft, the 412 available units are going for as low as RM380,000. The units are ‘family-sized’, from 1,100sq ft to 1,500sq ft.
“Prominence is designed for modern living. Every square foot of the condominium is built for residents who work or do business on Penang island but want the pleasure of living in a smaller town that is more economical and away from the hustle and bustle,” said Lee. The project will be showcased at The Star Property Fair 2014 from Oct 23 to 26 at Queensbay Mall. More than 16 exhibitors will be taking part in the fair which will be held from 10.30am to 10.30pm. The event is held for the second time this year. The exhibitors’ booths will be spread out in the mall’s north, central and south atriums. There will be talks and contests during the three-day event.